In 1934, Hitler had one problem…the French Maginot Line was the one thing standing in the way of Hitler invading France. In reality, it was the only thing that stood between Hitler and all of Western Europe. The French Maginot Line was a fortification running from the Rhine River to La Ferté consisting of concrete blockhouses, bunkers, and rail lines. The line was elaborate and extensive, and as rumors of its strength made their way to Germany, Hitler began to believe he’d need a miracle for his troops to break through it. 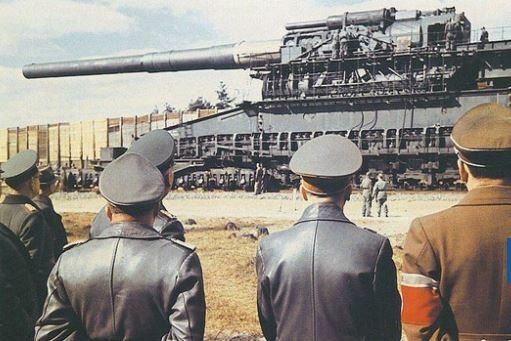 Hitler believed that he needed the biggest gun in history. Engineers from Krupp, a steel company from Essen, were commissioned by the German High Command (OKH) to design a weapon powerful enough to break through the concrete fortifications that were nearing completion. The shells alone had to be strong enough to penetrate 22 feet of reinforced concrete and at least three feet of steel plating, meaning the weapon had to be massive. It had to be to hold and shoot shells large enough to bring such massive destruction. 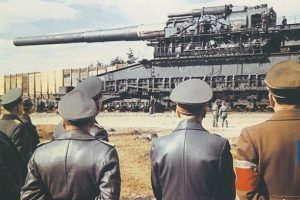 In order to meet the requirements that Hitler had set forth, Krupp engineer Erich Müller calculated that the weapon would have to be far bigger, and much more powerful than any weapon in existence. After much calculation, Müller put together the measurements for his goliath gun and presented the plan to the OKH. Though Hitler made no formal commitment, the high command knew the design, known as the Schwerer Gustav, was their answer. With a caliber of 31 inches, able to fire a projectile that weighed more than 10 tons 30 miles away, the Schwerer Gustave was incredibly imposing. The barrel was over 100 feet long, longer than any gun barrel in existence, and the body of the gun was bigger than any tank to see battle so far. It was more like a small building than a gun. From the ground up it was almost four stories tall. 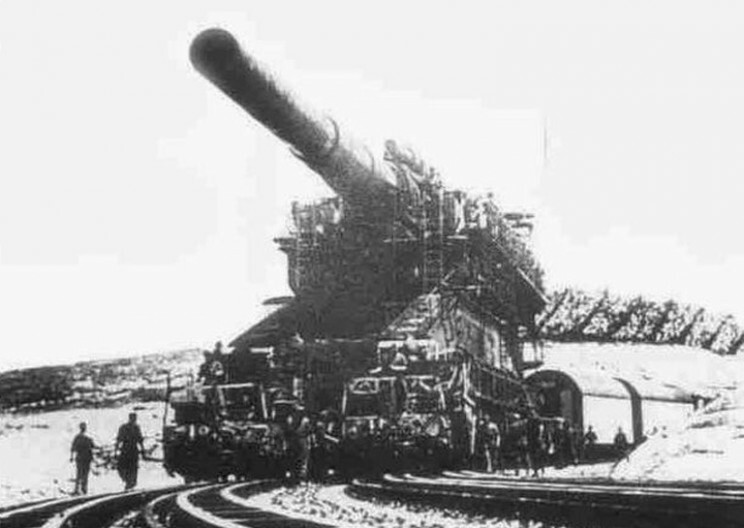 It was over 150 feet long including the barrel, and weighed over 1,300 tons. To compare it to things of today, the Space Shuttle weighs 2,000 tons. This was no tiny tank. The shells alone, which had been designed with pure destruction in mind, were taller than two men, twice as wide as one, and weighed 20,000 pounds each. It took several men just to load one into the barrel. For the gun to move around, the body was built on two parallel sets of rail wheels, allowing it to travel across special tracks. Ultimately, two of these weapons were ordered by the high command, the Schwerer Gustav and a smaller model they called “Dora.” However, the models weren’t ready by the time Hitler was, and the Germans were forced to invade France without them. Of course, they shouldn’t have been worried, as their troops far outnumbered the French’s static defenses. Even after the French quickly surrendered, Hitler still wanted to make use of his magnificent and destructive weapon. The siege of Sevastopol was the perfect opportunity. After five weeks of positioning the device, requiring 4,000 men, the weapon was ready. In five days, spanning between June 5 and June 17, the Schwerer Gustav fired 48 rounds, equaling 30,000 tons of ammunition. The barrel of the gun, which had already fired 250 rounds during testing, was worn out entirely. It took 500 men just to fire the gun, and after loading the oversized shells into the machine, they were exhausted. While the gun was daunting to anyone who saw it in action, it really wasn’t very practical. National Geographic us doing a whole series thing on hitler. It starts this week Nazi Mega Structures.